The team at Delicious Designs is dedicated to making amazing cakes. Cakes that taste as beautiful as they look. Our commitment to quality ingredients and impeccable customer service put us ahead of others in our area. 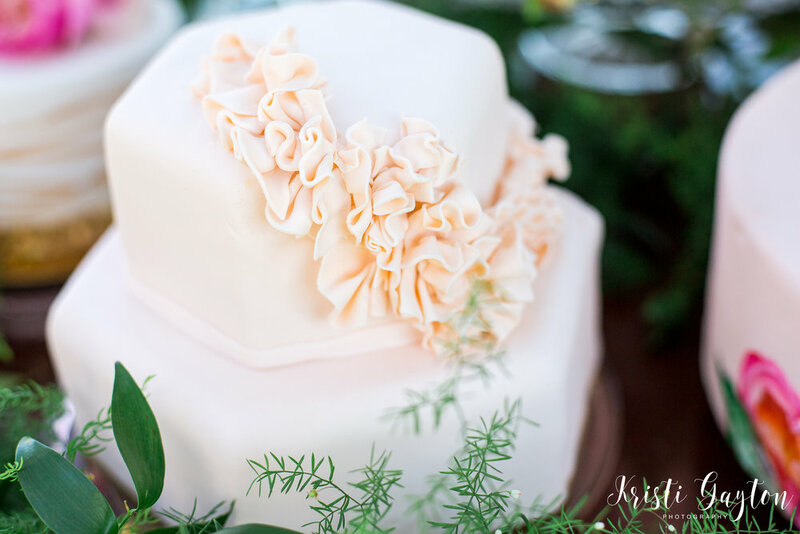 There are a lot of factors to consider when selecting someone to make your wedding cake or other special event cake and we want to work with you to address those factors. We can wow you with photos, and flavors but you won't understand the Delicious Designs difference until come in and meet with Leigh Anne and experience the difference her dedication makes. Delicious Designs can work within most budgets and we will do all we can to make your cake dreams come true. There are a few things we really need you to know about us and our cakes. Our cakes are always made from scratch. This means your cake is never frozen, poured from a box or lumped out of a can. We have over 15 years of experience, but don't worry we aren't antiquated. We stay on top of current trends. We think that getting to know you is probably one of the most important steps in creating your perfect cake. Whether it's your wedding or your first child's first birthday we want to really know you and we will work closely with you to design the perfect treats for your biggest moments. Don't you worry about a thing. We deliver and set up to make sure your cake is beautiful before we leave. We believe that the wedding cake is a huge part of the event. Let's be real, cutting your cake is the first thing you do together as a couple. Hand in hand you slice that first bite and whether you choose to feed each other gracefully or make a mess, you're still doing it together. Not only will that first bite look beautiful, but because we make our cakes from scratch, it will also taste delicious. We know that cake, might not always make the cut. We specialize in other special treats for your special events. We can make cookies, cupcakes, cake pops, dessert tables, or other pastries. We are thrilled for the opportunity to work with you and can't wait to be a part of your special event! We can and will tell you all about Leigh Anne's background, her education and year's of experience. But more importantly, you need to know that Leigh Anne loves to make cakes. Cakes with amazing ingredients, unique flavor combinations, cutting-edge technique and modern designs. That doesn't mean she can't or won't rock your classic four tiered wedding cake, it just means she can think outside the pink box. Nothing brings Leigh Anne more joy than arriving at an event, in her delivery cruiser and seeing the smiles on peoples faces when they not only see their cake for the first time but when they taste it for the first time. Her dedication to quality products and service assure that your special event's centerpiece will be loved by all. Leigh Anne started baking and cooking in high school by attending classes with the Culinary Institute of America (CIA). She graduated from the local Truckee Meadows Community College culinary program with degrees in both culinary arts and baking. Leigh Anne continues to take classes at the CIA to stay current. Leigh Anne lives in Reno with her dedicated husband and sweet twin boys, and loves to make cakes that make people happy.